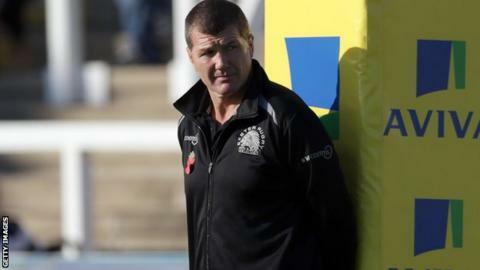 An English coach should replace Stuart Lancaster as England boss, according to Exeter Chiefs head coach Rob Baxter. Lancaster stepped down on Wednesday following the team's poor World Cup. Baxter reaffirmed his desire to see out his contract with the Chiefs, who are currently second in the Premiership. "English coaches are best placed to work on the management of England's best players through into an international environment and get the best out of them," he told BBC Sport. He cited Northampton's director of rugby Jim Mallinder and Leicester counterpart Richard Cockerill as possible England coaches. "Richard Cockerill has had a lot of success at Leicester, Jim Mallinder's done very well over a long period at Northampton," said Baxter. "There are coaches there who have done their time and I would like to think they would at least get asked, or be thought of as genuine contenders, before we start thinking that we've got to bring in an overseas coach." Who will replace Stuart Lancaster? The Rugby Football Union's chief executive Ian Ritchie said they would conduct a "global search" and were "looking for a head coach with international experience". But Baxter, 44, said English rugby's set-up, with players contracted to clubs as opposed to being centrally-contracted to a national union, would make it hard for a southern hemisphere coach. "England need to be very careful that they don't think they're going to put a coach into the English game, which is built differently through the Premiership clubs, and think that that guy's not going to get quite frustrated with what he wants to put in place," added Baxter. "We've got a very challenging structure here at club level. "It's very pressurised with promotion and relegation between the Championship and Premiership, and that creates new pressures and it creates people who can deal with these things and deal with difficult scenarios. "I don't see why guys who are flourishing in the Premiership can't go on and flourish in the international environment." Former Gloucester wing James Simpson-Daniel echoed Baxter's call for an English coach to take over the England job by tipping Worcester director of rugby Dean Ryan as the man for the job. "What we've got to do now is move in the direction of someone with experience. I'll tell you the person I think - but he won't do it - Dean Ryan," Simpson-Daniel, who played under Ryan during his time in charge of the Cherry and Whites, told BBC Radio Gloucestershire. "For 99% of the time when he was at Gloucester, he was brilliant. He's got coaching experience internationally with Scotland. He's had a lot of experience in the Premiership. "He's a forward, but he's got the best rugby brain that I've ever worked with in a coach. For someone that used to play so physically and brutally on the pitch, he has got a real rugby brain in that head. "I'd have loved to have seen Dean but I'm pretty sure he won't make himself available." Former England number eight Ryan, one of the 59 men spoken to by the RFU's exhaustive performance review, was not available ahead of Worcester's European Challenge Cup tie at home to Atlantique Stade Le Rochelais on Saturday. His place at the Warriors' weekly press conference was taken by his number two, head coach Carl Hogg, who is on good terms with Lancaster, having started his own coaching career under him when his playing days ended at Leeds. "I know Stuart very well," said the former Melrose, Edinburgh, Leeds and Scotland international. "He's a friend of mine. I played and coached alongside him at Leeds. He's a normal, hardworking bloke. And it's disappointing when someone loses their job. "Stuart has put a lot of things in place off the field and changed the culture of that England group. We're trying to achieve a similar philosophy here at Worcester. But that takes time. "It was always going to be tough. It's a results driven industry. If you don't qualify in a home World Cup, there's always going to be pressure. "It's the nature of what we do. International rugby is all about pressure. If you don't get results, then there's consequences." Northampton Saints prop Kieran Brookes was given his England Test debut by Lancaster, 46, during the 2014 summer tour of New Zealand and was a member of the World Cup squad. And the 25-year-old told BBC Look East that Lancaster had "taken the brunt" of England being the first World Cup hosts to be eliminated at the pool stage. "He's [Lancaster] a good coach, I've only ever had positive memories of it," said Brookes. "I was coached more by Andy Farrell and Graham Rowntree in the World Cup with defence and forwards work, but as a person I got on with him quite well and always had a good relationship with him. "He's helped bring an identity to the team, he's brought out what it means to play for England. 'Wear the Rose' was one of the big things, pride in the shirt."